This week started out with some rain a slightly cooler weather giving all a little relief. Then it turned warm along with a lot of Thunder Storm activity. This is never good for the guests fishing on the lake but for the fishing itself the storms seem to activate peaks in feeding activity. Northern Pike. 4th day they faced heavy rain & changing winds which made for a tougher time with how they like to present their lure and hard to control the boat, but despite these conditions they caught some fish. 5th day was one of their slower days but they still caught 20 Smallmouth Bass. 6th day was a really great day catching over 40 Northern Pike. 7th day was tougher as storms had them and the fish thrown off. 8th day they realized the larger Smallmouth Bass moved off their shallow locations and caught about 20 while searching out new spots. 9th day was good catching 32 Smallmouth Bass. 10th day was fabulous Pike fishing as they caught 43 Northern Pike with plenty of lost fish. 11th and 12th days they did well catching many Smallmouth Bass and a few Pike ending their trip. Ollie and Bob are two of the most engaging people with in the dinning room getting to know many other guests as they come and go during their extended stay with us. We missed them after departing but before leaving they made reservations for the same dates in 2019. Very Good Friend of Bob Waldeck (above), Rich Santos from Pasco, WA returned for his 5th consecutive year this time bringing his 12-year old Grandson Eli for his first Canadian Wilderness Fishing Experience. 1st day was great catching over 20 Northern Pike, which was Ely’s first experience fishing for Pike and was he ever excited about his day fishing with Grandpa. 2nd day was tough conditions with wind and rain cramping there fishing style but they still caught a few fish. 3rd day they did well catching Northern Pike with Ely all smiles in the dinning room after catching his biggest fish ever, a 30-inch Northern Pike. 4th day Ely caught 13 Northern Pike himself and Grandpa caught almost twice as many making for a memorable day for both. 5th day was a very good day as they caught well over 30 Smallmouth Bass and Ely had a fishing feat catching a Trophy Smallmouth Bass measuring 18-inches. 6th and final day was fun catching some fish and enjoyed their final hours enjoying and reminiscing about the memoires they made during the past week. 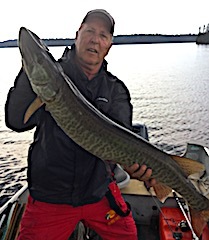 Long time guest Jerry Amer returned for his 2nd trip within the same month this time with his wife Lindy for her first ever Canadian Wilderness Fishing Experience. DOA was very exciting as they caught many Northern Pike, Lindy catching a nice big 33-incher and Jerry after having several misses on his surface lure, Whopper Plopper, he took it off and gave it to Lindy hoping she would catch a Pike on the surface and he pulled out and started using a Zara Spook. Well, on the first cast, as he was walking the dog, a big fish rolled on it and the fight was on. 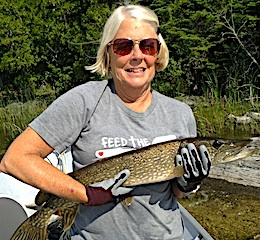 The fish was too big for the net, so Lindy got the cradle, and with having absolutely no experience, did a fine jog of netting Jerry’s fish, which was a 41.5-inch Muskie with a HUGE girth. 2nd day Jerry introduced Lindy to a portage on Closs Lake. Lindy really enjoyed the whole experience but said Jerry confused her a bit when he kept saying that Muskie were the fish of a 1000 casts and proceeded to catch three, 2 being in the mid 30-inch range. 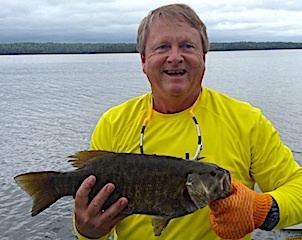 They also caught some very nice Smallmouth Bass Lindy catching a large 17.5-inch and Jerry landed an 18.5-inch Trophy. 2nd day was windy with some heavy rain periods driving them back to dry out. 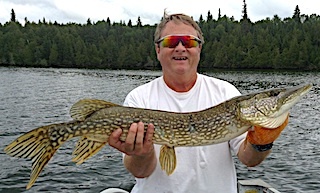 After the rain stopped they returned to fishing catching some nice pike with Lindy landing another Big Northern Pike. 3rd and final day the weather turned nice quickly and was an excellent day catching many Northern Pike at times one after another and when stopping to enjoy lunch they had a Bald Eagle with them perched in a tree just above their boat. Both left very enthusiastic about all their experiences and Lindy enjoyed the fishing plus the wilderness surrounding them. Brothers Mike and Jim McDonough from Pinetop, AZ and El Dorado Hills, CA returned for their 5th time. First day these two had a great time catching many Northern Pike saying they could have caught all the medium Pike they wanted but decided to fish for larger fish, and they were successful with Mike catching his 1st ever Trophy Smallmouth Bass measuring 18.5-inches while fishing a fly with a bubble on a spinning rod. Jim also caught a BIG 17.5-inch Smallmouth along with some larger Pike. 2nd day they had fun despite the windy rainy conditions catching some bigger Pike and Smallmouth Bass. 3rd day was portage day but the wind was blowing right down the lake making it difficult to fish, so they bailed early and caught some nice Pike and Smallmouth Bass on Little Vermilion Lake. 4th day was very good catching Smallmouth Bass including 4 Master Anglers Award Trophy Fish along with some nice Northern Pike. 5th and final day, Jim mentioning he could not believe their time went by so fast, was similar to their 4th but without landing a trophy. Both had loads of fun and laughter between two brothers, which is the biggest catch of all being that they live so far away from each other. Ted Payseur & Jan Anderson from West Des Moines, IA were here for there 4th year in a row bringing with them 1st year fisher at Fireside Lodge Jim Utter from Altoona, IA. 1st day they caught a lot of Smallmouth Bass and saw a lot of very large Smallmouth swimming around and just following their lures. Definitely an indication of the post spawn syndrome, which happens after the Bass leave their nests before putting the feedbags on. 2nd day was all about Muskie and bigger Northern Pike, this decision made because of the windy rainy conditions, & Ted hit it BIG catching a Huge 40-inch Muskie. 3rd day had them mixing it up with doing some trolling catching some nice Northern Pike. 4th day they found some BIG Smallmouth Bass in 12-13ft of water, Ted catching an 18 and 18.5-inch trophy plus a bunch of Northern Pike. 5th and final day was a fast a furious finish as they caught so many Northern Pike they lost count estimating 50 to 60 fish. All had a great time and hope to return in 2019. John Murphy (Dad / Grandfather) from Bloomfield, MI son Brian with his sons Quinn & Jack from Darien, CT returned to Fireside Lodge for their 7th consecutive year. 1st day out their day was cut short because of some sever T-Storms driving them in a 2PM but before that they caught a bunch of Northern Pike more than 30 in each boat. 2nd day it was one of those great fishing days as they caught at least 100 Northern Pike. 3rd day was just a few hours of fishing, as they had to depart by noon to catch a flight back home enjoying the morning catching some fish and soaking up the final minutes before they were off to the big city. When departing they left their tackle with me for the planned 2019 visit with us at Fireside Lodge. Al Fishhaber and fishing buddy Rob Delamatre from Northfield & Sandusky, OH, 25-Year guests were back to chase the BIG Toothy Critters. DOA they only had about and hour and a half to fish & they made the most of it catching 20 nice size Northern Pike and Rob landed a beauty 39-inch Muskie, just before a T-Storm. 2nd day was a quantity day catching at lease 70 Northern Pike with Rob landing most of his Fly-Fishing. After that flurry they tried to locate bigger fish and they did, with AL having a Monster Northern Pike follow him up just to take a look and slowly swim away. 3rd day was a 30+Fish day with Rob stealing the show and Al playing the roll of guide most of the day. They caught some substantial size Northern Pike covering a lot of water to do so. 4th day was good action on average size Northern Pike landing 50+ and Rob, again having the hot hand catching a very large 39-inch Northern Pike. 5th day had them catching 30+ Northern Pike while in search for the monsters. 6th and final day the biggest fish of the trip was caught being Rob’s 41.5-inch horse of a Northern Pike, and the story of the catch is the best part. Sometime after Rob released a small Northern Pike they noticed it belly up so in an attempt to go back and revive the Pike and as they were approaching the area Rob slung a cast towards it in hopes it would be startled and right itself. Well as soon as his lure hit the water a big explosion occurred and before Rob knew it the battle was on with his soon to be Trophy Northern Pike. We figured the Big Pike was eyeing up the small struggling Pike when Rob casted towards it and caused the fish to react. This was in the final hours of their last day and what a great way to finish their trip. When departing they said they will be back next year as they have for the last 25 years. John & Beverly White from Murphy, NC returned with their son Geoffrey and his wife Laura from Huntersville, NC. 1st day all had fun catching some fish with John coming up with the money fish landing a Trophy 18.75-inch Master Anglers Award Smallmouth Bass. 2nd day they were all off to a portage lake and did they ever have a blast fishing all 4 in a 14ft boat. This is enough to create some situations, and then catching 77 Northern Pike really made for a fun filled memorable day. The next morning Geoff had to resupply some tackle that was destroyed from catching all those Pike. 3rd day they enjoyed a creek ride up to another lake, which was, very good action for Northern Pike catching over 50 fish. 4th day they went geo-caching most of the day. This was all new to me but as they explained what it was I found it very interesting. In fact we had a cache placed by our small directional road sign. They located that one which was Beverly & John’s 3000th find. They also hiked Sioux Mountain, a known scenic location in Sioux Lookout, and found more caches while seeing a spectacular view atop this mini mountain top the Ojibway tribe used as a lookout for approaching enemies. 5th day was tremendous fast action as each boat caught well over 30, total at 64 with losing almost as many as they caught. 6th and final day was met with some substantial rainfall in the morning, which got them to do something different. They went exploring some back logging roads having a good time doing so. 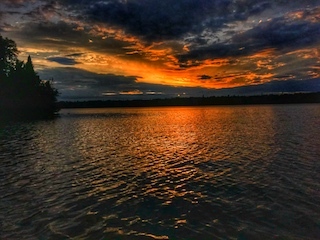 Geoff & Laura went fishing after supper but is was more to enjoy the evening on the water and watch a fabulous sunset while Beverly did the same from the chairs at the end of our dock. All had a FABULOUS time and hope to return with more family members. Henry Espinoza from Custer MI was returning for his 2nd time with his wife Sue for her first experience at Fireside Lodge. DOA was FABULOS catching 16 Northern Pike before suppertime. Seems like Henry did not miss a beat remembering his fishing spots from his previous visit. 1st day was very good as they combined for a total of 21 Northern Pike. 2nd day we had Thunder Storms, which brought them in before noon and limited their fishing time but they did catch fish between the storm activity. 3rd and final day (WOW 3 days goes fast) they said was very good catching Northern Pike and Smallmouth Bass. Many times as either Sue or Henry was catching a Smallmouth there would be 4 or 5 swimming right behind the one they were catching. They each caught a Master Anglers Award Smallmouth Bass measuring 18 and 18.5-inches. Both had a wonderful stay with us fishing in the Canadian Wilderness and meeting some very nice people in the dinning room. Upon departing they expressed a possible return again with their sons who had come with Henry on his first trip. Craig and Judy Brown from Midland, TX were visiting us at Fireside Lodge for their 1st time. First day ever on the water Craig said they did great catching Northern Pike and Smallmouth Bass and at one point Judy caught 3 Pike in 3 casts. 2nd day was a very good day fishing Northern Pike catching many and some larger fish in the mid 30-inch range. When talking with Judy she expressed how peaceful it was when fishing on Little Vermilion Lake. 3rd & final day was terrific having near perfect fishing conditions, cloudy, calm, with warm temperatures. They took advantage of the day making a longer day of it going to a creek accessible lake and had an absolute blast catching near 35 Northern Pike. Craig and Judy thoroughly enjoyed their 3-day stay and hope to return in 2019 with Craig’s father.